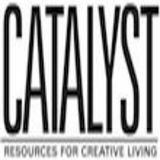 CATALYST has its finger on the pulse of our society's most intriguing movement: the rise of the "cultural creatives" — those who take a whole-systems approach to the world's ecological, social and spiritual crises. This has netted us the enthusiastic support of the community — and a stable of terrific advertisers, who value the unique demographics our editorial content attracts. Our growth since 1982 has been steady. Conservative, one might say. We prefer the word "organic." If conservative growth produces an institution, organic growth grows an organism — something vital, alive, responsive. We think we've got a venerable organism here.